Why do girls sports not get as much recognition as boys’ sports? Early in the morning, congratulations of the boys teams for achieving the bare minimum can be heard, while whispers of the girls’ success are only passed around. This is the third year in a row that girls soccer has made it to playoffs, yet you’ll find more posts about the boys being league champs for the first time in 10 years. 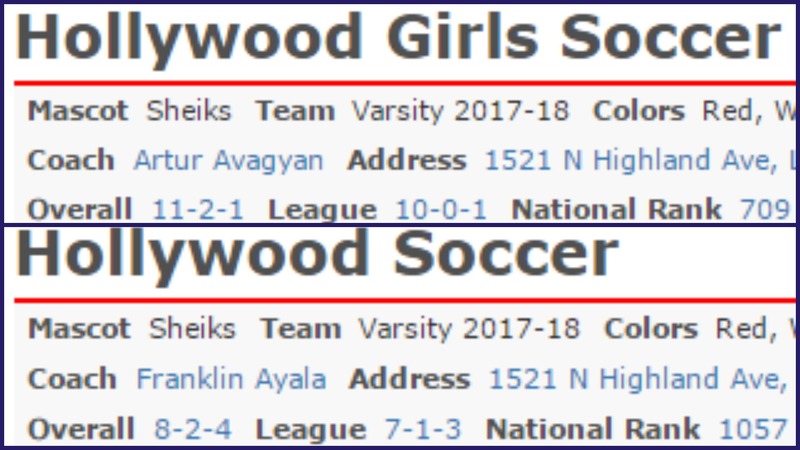 This is the first time in a while that girls volleyball has made it to playoffs (they made it far; semifinals), but around that time, the Hollywood High School Instagram kept posting about football, 2 weeks after they lost in the first round and their season was ended. Boys basketball is successful, yes, but why are the seats empty when the girls have home games. The underlying sexism in public schools is obvious, ranging from rules to dress codes. It is wildly apparent in the vast difference in how girls teams are treated compared to boys teams. This is a serious issue that needs to be addressed because it only encourages the athletic success of men, but not women, which further contributes to the wage gap in mens and womens sports. The showing for girls basketball is sad. If you walk in the Hollywood High School gym when there is a home game the stands are nearly empty. Girls basketball gets even less advertisement than girls soccer. They are forgotten in the morning announcements and are rarely heard of when they win. This is sad. Girls and Boys sports should be celebrated and shown off equally. Although league champs for 3 years in a row, Girls soccer has never gotten a banner while I have been in high school. During my freshman year, we were told that there was not enough money for it. A banner. Yet football got a banner for their 2017-18 season for no apparent reason. It is 2018. People are still searching for a reason why women are getting treated the way they are as adults, and I think to eliminate the subtle sexism early on, like in grade schools, would be a good start to demolish the inequality between the sexes.